This July I will be participating in the Augmented Sound Program at Composit. The festival takes place yearly in Rieti, Italy, and brings together composers, performers and sound artists from all over the world. Peter Ablinger, Pierluigi Billone, and Jean-Louis Fraçois are this year's faculty members. One of the things that drew me to Composit this year was the chance to explore the city's historic underground - la Rieti Sotterranea. In the city's undergroud, its Roman, medieval, and recent past overlap, and the sound artists we invited to work in that indescribable space. Working in collaboration with Alex Ness, the result was "Domanda Benedizione Sonore", an interactive sound installation that dealt in ritualized gesture and heritage. A collaborative project between five Boston University composers and flute virtuoso Cheng-Yu Wu, culminating in the premiere and studio recording of LOVESONG, for flute, harp, cello, and electronics. Allison Balcetis plays saxophone etude #2, "The Scourging at the Pillar", at the Bordeaux Conservatoire Jacques Thibaud. Co-hosted by Arts Connect International and UMass Boston's School of Global Inclusion and Social Development, this innovative symposium showcases the work of ACI's artists, local artists, as well as some of the talent of the UMass Boston community. The event will feature important dialogues and different artistic workshops, all provided myriad local arts leaders, featuring over twenty-five local community partners. The day will include TEDx-Style presentations, panel discussions, artistic workshops across multiple disciplines, community yoga, and an artists' mingle for celebrations of life and inclusion (detail and registration here). Clarinetist David Angelo and I have prepared a sound installation for the Arts & Ideas in Action Symposium happening at Boston University's School of Visual Arts and Design. The piece made use of Bb clarinet recordings and was diffused through 3 transducers installed in air ducts. Invited by Dr. Susan Conkling, and along with Boston University colleague's Margaret Rowley and Jessica Warren, I will be taking part in the panel "Preparing Future Faculty for New Roles in Arts and Humanities". This year's A2ru conference will take place at University of Colorado, Denver. Performance by Cheng-Yu Wu as part of the Hypercube + 10 Poems concert, taking place in the Hong Kong Visual Arts Center. Works also by: Felipe Pinto d'Aguiar, Lam Lai, and Tak Cheung Hui. I'll be joining violist Carrie Frey and pianist Robert Fleitz on a week-long incubation period at beautiful Avaloch Farm. The three of us will be working on a piece for toy instruments. I can't wait to see where this collaboration leads! For more on Carrie & Robert's work, check out this newly released CD featuring Grieg and Wurts sonatas. In an program of all-Brazilian composers, Allison Balcetis and Roger Admiral will give the North American premiere of Mind Under Matter as well as a performance of The Sorrowful Mysteries's Etude n.3 - The Crowning with Thorns, which has been recently revised. 8PM. Convocation Hall, University of Alberta. Edmonton, Canada. By flutist Cheng-Yu Wu as part of the Hypercube project. This summer I'm taking part in the 72nd Composers Conference and Chamber Music Workshop at Wellesley College. "Vigília" a new work for woodwinds, two percussion sets and two string quartets will be premiered by the conference's ensemble. A commission from the Hypercube project, headed by composer Tak Cheung Hui and flutist Cheng-Yu Wu, receives its premiere at the Taipei Philharmonic Cultural Center in Taiwan. 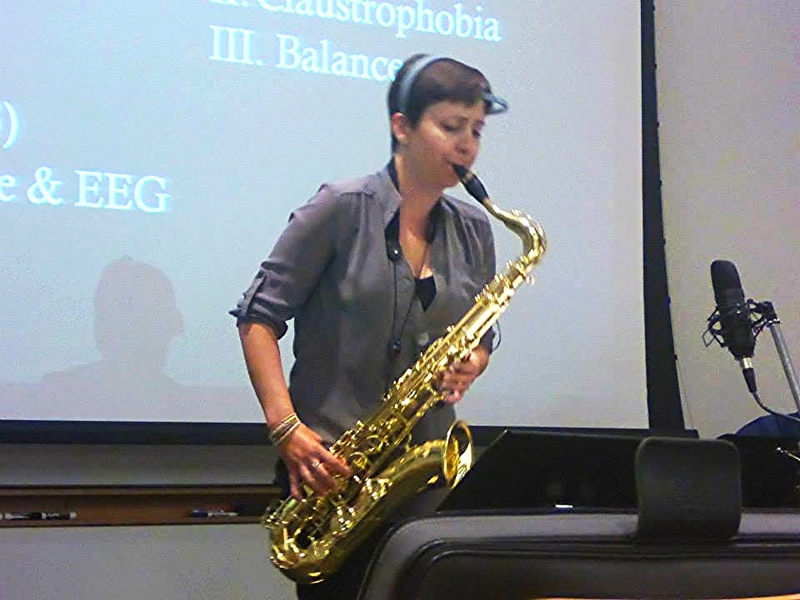 Saxophonist and long-time collaborator Allison Balcetis is playing a concert entirely on tenor which includes a performance of Agony in the Garden, the first study of the Sorrowful Mystery series. At the invitation of Dr. Dominique Haughton, Professor of Mathmatical Sciences and Global Studies, I joined Bentley University's Music Analytics Group for an afternoon of Max-MSP, discussing it applications for the classroom, research and artistic performance. The Building Inclusive Communities conference, hosted by UMass Boston's School for Global Inclusion and Social Development, brings together leaders across industries and disciplines to foster new strategies for increased inclusion. Our attendees and presenters are policymakers, educators, faith leaders, and entrepreneurs–as well as self-advocates who are making inclusion a reality in underserved populations. Arts Connect International will be present at the Conference with Marian Brown giving a TED-style talk on Thursday, 11:45AM. The talk will feature the premiere of an ACI documentary which offers the view on the organization's Artist Leaders on Inclusion. Clips from the 2 edition of Curto-Circuito will also be shown during the conference. The miraculous JACK comes to Boston for a concert of works by the Boston University Center for New Music composers. The program includes the north american premiere of Corpo Confesso, which was revised earlier this year for the Beijing Modern Music Festival. This innovative symposium and pop-up artist exhibition will showcase the work of Arts Connect International Artist Leaders; catalyzing conversations on inclusion in our Boston community and beyond. All of ACI's Artist Leaders work as change agents nationally and internationally through his/her art form. This one day symposium is designed to promote cross-sector and multi-disciplinary approaches to building and supporting inclusive environments. Environments where collaboration is paramount, where innovation is innate, and where acceptance and celebration of diversity rests at the core. Participation as a composer fellow in Brazil's most traditional classical music festival. Premiere of Corpo Tangido, Corpo Soprado. The award-winning Amber Quartet gives the Asian premiere of the recently revised Corpo Confesso. Where: Piano Hall, Central Conservatory of Music, Beijing, China. "Respostas de uma Arte em Desencanto"
Palestra nos tópicos de semiótica, música contemporânea e transumanismo. Grupo de Pesquisa de Mídias, Cidades e Práticas Socioculturais. O Curto-Circuito Internacional de Saxofone Brasil/Canadá compreende uma série de masterclasses, workshops e concertos com a solista Allison Balcetis, da Universidade de Alberta, do Canadá. Aclamada pelo seu envolvimento com o repertório contemporâneo, Allison traz ao Brasil uma seleção de obras inéditas em solo nacional, explorando os limites técnicos de seu instrumento e as mais variadas possibilidades artísticas e tecnológicas. Para mais informações e a agenda completa do evento, por favor visite nossa página oficial. As part of the Curto Circuito Internacional de Saxofone Brasil-Canadá and it's Composition Workshop, there will be a meeting with the participants in Campinas-SP to discuss the ongoing works. Music meets neuroscience. The other Dr. Balcetis will perform on saxophone works of new music by composer André Mestre, accompanied by EEG technology. She will lead a discussion on how expectations and motivations of both the performer and the audience change our experience of music. Amy Krosch (just featured The Colbert Report) will share with us what is happening in the brain that changes the sounds that we are hearing. With mentors Ye Xiaogang and Juliet Palmer. Working with the Cecilia String Quartet during a period of 11 days in Toronto. The premiere took place during the 'Now Hear This', Edmonton's premiere new music festival. The concert was the debut of the Violet Collective, an ensemble devoted to the performance of new and adventurous. 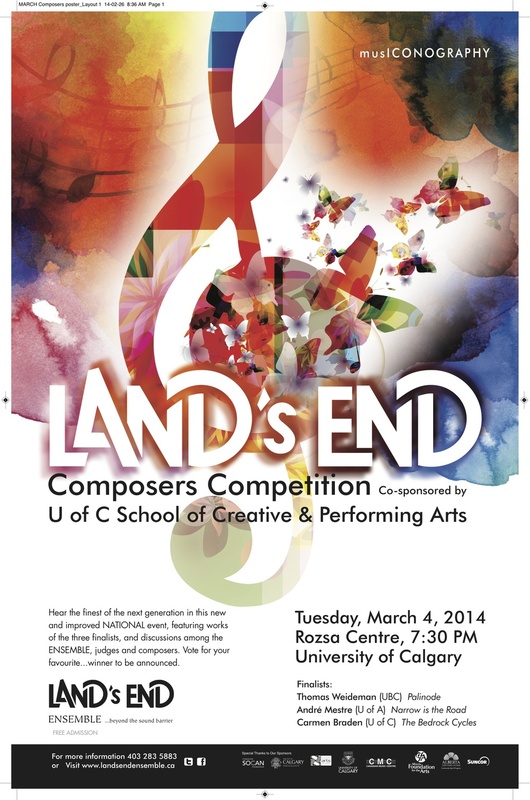 The work "Narrow is the Road" received its premiere by the Calgary-based, Juno Award-winning, Land's End Ensemble. The public concert was part of their annual new music competition. The programme also contained works by Thomas Weideman and Carmen Braden.